The afforestation was carried out around the city in order to prevent hazardous environmental and air pollution problems and with the purpose of recreational urban forests facility for public health in Green Belt Afforestation Project in 2003-2004 supported by Kahramanmaras Regional Directorate of Forestry. Our study was performed in one of the Green Belt Afforestation Fields (1675 ha.) area near the city center. In the study Pinus brutia, Pinus pinea, Cupressus sempervirens, Prunus mahalep, Amygdalus sp, Pyrus elaegnifolia and the alien origin Pinus brutia var. elderica plant species were used. A large quantity of disorders and dryness in the alien origin (Pinus brutia var. Elderica) were observed during the study. Greater number of insect and fungal diseases were detected on this species than others. The insects including Thaumetopha pityocampa-wilkinsoni (Lep. ), Rhyaciona buoliana (Lep. ), Ortotomicus erosus (Scolytidea, Col.), Hylurgus ligniperda (Scolytidea, Col.), Hylurgus micklitzi (Scolytidea, Col.), Tomicus piniperda (Scolytidea, Col.), Tomicus destruens (Scolytidea, Col.), Ips sexdentatus (Scolytidea, Col.), Leucaspis pusilla (Coccoidea-Hem.) and some fungal diseases such as Melampsora piniturqua, Diplodea pinea were detected. As a result of observing the form disorder within the whole tree species, some factors such as climate, bedrock and soil characteristics were examined. As a result of the combination of inefficient bedrock and soil conditions with adverse climatic conditions, it has been determined that trees that cannot be well adapted to the conditions of the site were weakened and finally dried. Consequently, the selection of the suitable species is very important in terms of ecological and economic aspects considering the site factors in order to minimize the diseases of insect and fungi in the future afforestation. Kahramanmaraş İlinde tehlikeli boyutlara ulaşan çevre ve hava kirliliği problemlerini önlemenin yanında rekreatif amaçlı kent ormanları tesisi de düşünülerek Kahramanmaraş Orman Bölge Müdürlüğü tarafından 2003-2004 yıllarında Yeşil kuşak Ağaçlandırma Projesi kapsamında kentin çevresinde ağaçlandırmalar yapılmıştır. Bu ağaçlandırma çalışmalarından kent merkezine yakın olan 1675 ha lık sahada araştırmamız gerçekleştirilmiştir. Ağaçlandırma sahasında Pinus brutia, Pinus pinea, Cupressus sempervirens, Prunus mahalep, Amygdalus sp, Pyrus elaegnifolia ve yabancı orijinli Pinus brutia var. elderica türleri kullanılmıştır. Kullanılan türlerden yabancı orijinli Pinus brutia var. elderica da oldukça fazla miktarda form bozuklukları ve kurumalar olduğu gözlemlenmiştir. Bu türde diğer türlere göre daha fazla böcek ve mantar hastalık zararlıları tespit edilmiştir. Bu zararlı böcekler arasında Thaumetopha pityocampa-wilkinsoni, Rhyaciona buoliana, Ortotomicus erosus, Hylurgus ligniperda, Hylurgus micklitzi, Ips sexdentatus, Leucaspis pusilla gibi zararlı böceklerle, Melampsora piniturqua, Diplodea pinea gibi mantar hastalıkları tespit edilmiştir. Ağaç türlerinin genelinde kurumaların gözlemlenmesi sonucunda yetişme ortamı faktörlerinden iklim, anakaya ve toprak özellikleri incelenmiştir. Verimsiz anakaya ve toprak koşullarının olumsuz iklim koşulları ile birleşmesi sonucunda bu alandaki yetişme ortamı koşullarına uyum sağlayamayan ağaçların zayıf düştüğü ve sonunda kurumaların görüldüğü tespit edilmiştir. Bu çalışmada ileride yapılacak ağaçlandırmalarda sekonder zararlılar olan kabuk böceği ve mantar zararlarının en aza indirilmesi için yetişme ortamı faktörlerinin de göz önünde bulundurularak uygun türlerin seçimi ekolojik ve ekonomik açıdan oldukça önemli olduğu sonucuna varılmıştır. Anonim 1992. Orman Genel Müdürlüğü. Yeşil Kuşak Ağaçlandırma Çalışmaları. Tamim No:10. Avcı M 2005. Çeşitlilik Ve Endemizm Açısından Türkiye’nin Bitki Örtüsü. İstanbul Üniversitesi Edebiyat Fak. Dergisi, Sayı:13, S 27-55. İstanbul. Blake GR 1965. Particle density. In: Methods of Soil Analysis, Part 1. Physical and Mineralogical Methods, ed. A Klute, Agronomy Monograph 9, American Society of Agronomy-Soil Science Society of America, Madison, Wisconsin, USA, pp. 371–373. Brearley F 2005. Nutrient limitation in a Malaysian ultramafic soil. Journal of Tropical Forest Science. 17(4): 596-609. Bouyoucos GJ 1962. Hydrometer method improved for making particle size analyses of soils. Agronomy Journal, 54: 464-465. Brooks RR 1987. In Serpentine and Its Vegetation, ed. TR Dudley. Portland, OR: Dioscorides. 454 pp. Brooks RR, Yang XH 1984. Elemental levels and relationships in the endemic serpentine flora of the Great Dyke, Zimbabwe and their significance as controlling factors for this flora. Taxon 33:392–99. Çanakçıoğlu H, Eliçin G 1998. FİTOPATOLOJİ Özel Bölüm. İstanbul Üniversitesi Or. Fak. Yayınları Rektörlük No:4156, Fakülte No:456, 322s, İstanbul. Çanakçıoğlu H, Mol T 1998. Orman Entomolojisi, Zararlı Ve Yararlı Böcekler. İstanbul Üniversitesi Or. Fak. Yayınları 542s İstanbul. Günay İ 2001. Çamlarda Dilodia (Diplodia pinea Desm.) Hastalığı. 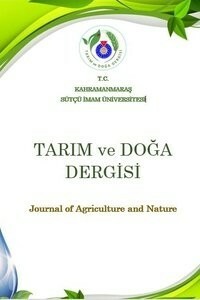 Doğu Akdeniz Ormancılık Araştırma Müdürlüğü DOA DERGİSİ (Journal of DOA) Sayı : 7 Yıl:2001. Hızalan E, Ünal H 1965. Topraklarda önemli kimyasal analizler. A.Ü. Zir. Fak. Yay. No:278, Yrd. Ders Kitabı No:97. A.Ü. Basımevi. Ankara. Janzen HH 2004. Carbon cycling in earth systems-a soil science perspective. Agriculture, Ecosystems and Environment, 104,399-417. Jenny H 1980. The Soil Resource: Origin and Behavior. Ecol. Stud. 37:256–59. New York: Springer-Verlag. 377 pp. Krause W 1958. Andere Bodenspezialisten. In Handbuch der Pflanzenphysiologie, ed. G Michael, 4:758–806. Berlin: Springer-Verlag. Kruckeberg AR 1954. The ecology of serpentine soils: A symposium. III. Plant species in relation to serpentine soils. Ecology 35:267– 74. Kruckeberg AR 1985. California Serpentines:Flora, Vegetation, Geology, Soils, and Management Problems. Berkeley: Univ. Calif. Press. 180 pp. Kruckeberg AR 2002. The influences of lithology on plant life. In Geology and Plant Life; The Effects of Landforms and Rock Type on Plants, pp. 160–81. Seattle/London: Univ. Wash. Press. 362 pp. Loew O, May DW 1901. The relation of lime and magnesia to plant growth. U.S. Dep. Agric. Bur. Plant Ind. Bull. 1:1–53. Małek S, Januszek K, Barszcz J, Błońska E, Wanic T, Gąsienica-Fronek W, Kroczek M 2011. Preliminary assessment of the ecochemical condition of soils after fertilization of younger spruce Picea abies (L.) H. Karst. stands in the Beskid Śląski and Żywiecki Mts. Folia Forestalia Polonica, A, 53(2), 93-104. Marrs RH, Proctor J 1976. The response of serpentine and nonserpentine Agrostis stolonifera L. to magnesium and calcium. J. Ecol. 64:953–64. Moody JB 1976. Serpentinization: a review. Lithos, 9, 125–138. O’Hanley DS 1996. Serpentinites: Records of Tectonic and Petrological History. New York: Oxford University Press. Özdeniz E, Özbey BG, Kurt L, Bölükbaşı A 2017. Serpantin Ekolojisi ve Türkiye Serpantin Florası’na Katkılar. Toprak Bilimi ve Bitki Besleme Dergisi 5 (1) 22 – 33 Ankara. Proctor J 1970. Magnesium as a toxic element. Nature 227:742–43. Proctor J 1971. The plant ecology of serpentine. II. Plant responses to serpentine soils. J. Ecol. 59:397–410. Proctor J, Woodell SRJ 1975. The ecology of serpentine soils. Adv. Ecol. Res. 9:255– 365. Proctor J 2003. Vegetation and soil and plant chemistry on ultramafic rocks in the tropical Far East. Perspectives in Plant Ecology, Evolution and Systematics. 6(1-2): 105-124. Rascıo N, Navari-Izzo F 2011. Heavy metal hyperaccumulating plants: How and why do they do it? And what makes them so interesting? Plant Science 180.2: 169–181. Ritter-Studniˇcka H 1968. Die serpentinomorphosen der flora bosniens. Bot. Jahrb. 88: 443–65. Sarıkaya O, Avcı M 2011. Bark beetle fauna (Coleoptera: Scolytinae) of the coniferous forests in the Mediterranean region of Western Turkey, with a new record for Turkish fauna. Turk J Zool 2011; 35(1): 33-47. Şahin K, Avcıoğlu B 2017. Türkiye Çölleşme Risk Modeli. 2023’e Doğru 4.Doğa ve Ormancılık Sempozyumu Bildiri Kitabı. 3-6 Aralık 2017 Antalya. TMMOB Orman Mühendisleri Odası.ISBN:978-605-01-1108-8. URL-1.https://pestalert.org/storage/H_ligniperda_ds94.pdf. Ülgen N, Ateşalp M 1972. Toprakta Bitki Tarafından Alınabilir Fosfor Tayini, Köy İşleri Bakanlığı, Topraksu Genel Müdürlüğü, Toprak ve Gübre Araştırma Enstitüsü, Teknik Yayınlar Serisi, Sayı 21, Ankara, 17 s.
Walker RB 1948. A study of serpentine soil infertility with special reference to edaphic endemism. PhD thesis. Univ. Calif., Berkeley. 101 pp. Walker RB 1954. The ecology of serpentine soils: A symposium. II. Factors affecting plant growth on serpentine soils. Ecology 35:259–66. Walker RB, Walker HM, Ashworth PR 1955. Calcium-magnesium nutrition with special reference to serpentine soils. Plant Physiol. 30:214–21. Walkley A, Black A 1934. An examination of the Degtjareff method for determining soil organic matter, and proposed modification of the chromic acid titration method. Soil Science, 37: 29–38.